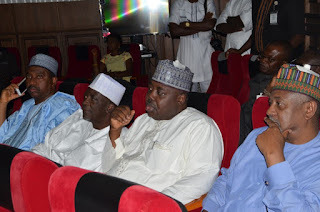 Former Minister of State for Finance, Bashir Yuguda; former Governor Attahiru Bafarawa and his son, Sagir Attahiru and Dalhatu Investment Limited may have to account for over N18.09billion when their trial begins next week. The cumulative cash does not include the $9.809million allegedly collected by ex-Minister of State Yuguda from ONSA between December 23, 2014 and February 10, 2015. According to the charge sheet filed by EFCC, the suspects benefited from the said funds between April 14, 2014 and May 7, 2015. 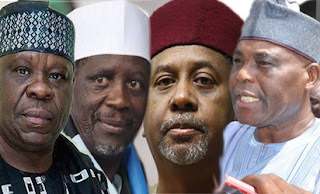 Some of the charges are : “That you Col. Mohammed Sambo Dasuki whilst being National Security Adviser and Shaibu Salisu, whilst being the Director of Finance and Administration in the Office of the National Security Adviser between 14th April and 7th May 2015 in Abuja within the jurisdiction of this Honourable Court entrusted with dominion over certain properties to wit: an aggregate sum of N3.350billion being part of the funds in the account of the National Security Adviser with the CBN, committed criminal breach of trust in respect of the said properties when you transferred same to the account of Dalhatu Investment Limited with United Bank for Africa Plc purporting same to be payment for the supply of security equipment and you thereby committed an offence punishable under Section 315 of the Penal Code Act, Cap 532, Vol.4, LFN 2004. “That you Dalhatu Investment Limited, Sagir Attahiru and Attahiru Dalhatu Bafarawa between 14th April 2014 and 7th May 2015 in Abuja within the jurisdiction of this Honourable Court, dishonestly received stolen property, to wit: an aggregate sum of N3.350billion with UBA Plc from the account of the Office of the National Security Adviser(ONSA) with the Central Bank of Nigeria(CBN), which belonged to the Federal Government of Nigeria and knowing the said sum to be stolen property but purporting same to be payment for the supply of security equipment and you thereby committed an offence punishable under Section 317 of the Penal Code Act, Cap 532, Vol.4, LFN 2004. “That you Dalhatu Investment Limited, Sagir Attahiru and Attahiru Dalhatu Bafarawa between 14th April 2014 and 7th May 2015 in Abuja within the jurisdiction of this Honourable Court knew that an aggregate sum of N3.350billion directly represented the proceeds of criminal conducts of Col. Mohammed Sambo Dasuki and Shuaibu Salisu who were National Security Adviser and the Director of Finance, Office of the National Security Adviser respectively (to wit: criminal breach of trust in respect of the said amount) had possession of the said property and you thereby committed an offence punishable under Section 317 of the Penal Code Act, Cap 532, Vol.4, LFN 2004. “That you Col. Mohammed Sambo Dasuki whilst being National Security Adviser and Shaibu Salisu, whilst being the Director of Finance and Administration in the Office of the National Security Adviser on or about 20th December 2013 in Abuja within the jurisdiction of this Honourable Court entrusted with dominion over certain properties to wit: N500million being part of the funds in the account of the National Security Adviser with Skye Bank Plc, committed criminal breach of trust in respect of the said property when you transferred same to the account of Dalhatu Investment Limited with United Bank for Africa Plc purporting same to be payment for the supply of security equipment and you thereby committed an offence punishable under Section 315 of the Penal Code Act, Cap 532, Vol.4, LFN 2004. “That you Col. Mohammed Sambo Dasuki whilst being National Security Adviser and Shaibu Salisu, whilst being the Director of Finance and Administration in the Office of the National Security Adviser, Bashir Yuguda whilst being the Minister of State for Finance between 5th February and 16th April 2015 in Abuja within the jurisdiction of this Honourable Court entrusted with dominion over certain properties to wit: an aggregate sum of N1.1billion being part of the funds in the account of the National Security Adviser with CBN committed criminal breach of trust in respect of the said property when you transferred same to the account of Jabbama Ada Global Services Nigeria Limited for the purpose of financing the campaign of PDP in the 2015 general election and you thereby committed an offence punishable under Section 315 of the Penal Code Act, Cap 532, Vol.4, LFN 2004. “That you, Bashir Yuguda whilst being Minister of State for Finance between 23rd December 2014 and 10th February, 2015 in Abuja within the jurisdiction of this Honourable Court dishonestly misappropriated certain property to wit: an aggregate sum of $9,809,619 which was an equivalent of the aggregate sum of N1,950,000,000 belonging to the Federal Republic of Nigeria, which sum was transferred to Jabbama Ada Global Services to be converted into the said dollars and you thereby committed an offence punishable under Section 309 of the Penal Code Act, Cap 532, Vol.4, LFN 2004. “That you Col. Mohammed Sambo Dasuki whilst being National Security Adviser and Shaibu Salisu, whilst being the Director of Finance and Administration in the Office of the National Security Adviser, between August 2013 and February 2015 in Abuja within the jurisdiction of this Honourable Court dishonestly misappropriated certain property to wit: an aggregate sum of N1.675billion belonging to the Federal Republic of Nigeria which sum was transferred to the account of Vibrant Resources Limited controlled by Abubakar Dasuki, the younger brother of Col. Mohammed Sambo Dasuki, the then National Security Adviser and you thereby committed an offence punishable under Section 309 of the Penal Code Act, Cap 532, Vol.4, LFN 2004. “That you Col. Mohammed Sambo Dasuki whilst being National Security Adviser and Shaibu Salisu, whilst being the Director of Finance and Administration in the Office of the National Security Adviser, Bashir Yuguda whilst being the Minister of State for Finance between 14th April 2014 and 7th May, 2015 in Abuja within the jurisdiction of this Honourable Court agreed to do an illegal act to wit: criminal breach of trust by public officers in respect of an aggregate sum of N5,050billion being part of the funds in the account of the National Security Adviser with CBN and that the same act was done in pursuance of the agreement among you and you thereby committed an offence punishable under Section 97 of the Penal Code Act, Cap 532, Vol.4, LFN 2004. “That you Bashir Yuguda, Dalhatu Investment Limited, Sagir Attahiru and Attahiru Dalhatu Bafarawa between 2013 and 2015 in Abuja within the jurisdiction of this Honourable Court agreed to do an illegal act to wit: dishonestly receiving stolen property to wit: an aggregate sum of N4.633billion being part of the funds in the accounts of the ONSA and that the same act was done in pursuance of the agreement among you and you thereby committed an offence punishable under Section 97 of the Penal Code Act, Cap 532, Vol.4, LFN 2004.